Some things never change. People are always going to move for a variety of reasons. This means they will be on the hunt for a wide variety of services such as which local grocery store they will go to, what school (if they have kids) will they attend, and who will be their doctor. This is a prime opportunity to get through the door to their new home. Now, how we get there has changed over the years. At LionShare, we have been managing New Mover Programs in the healthcare industry since our inception in 1995. Over the last 20 years, we have conducted, analyzed, and tested hundreds of New Mover Programs to the point we are confident in what makes these programs successful. And we love sharing this knowledge with our clients. What we have learned as we have evolved over the years is that New Mover Programs are more than just a piece of mail. LionShare strives to stay ahead of the curve and we have honed our best practices to guarantee utilization, ROI, and client satisfaction. So, what has LionShare discovered that sets us apart in consistently demonstrating success? The practices that drive these successes are integrated user journeys, personalization, and nurturing relationships. But most of all, we like to test; a lot. At LionShare, we live and breathe data, so it should be no surprise that we love to test, test, test! This is where New Mover Programs become more than just a mail piece. We develop integrated user journeys that not only include the traditional direct mail piece, but dive even further with emails, Pay Per Click (PPC), Facebook ads, banner ads and retargeting based on online and response activity. A primary benefit of this strategy is that new movers see your organization in more than one facet and the retargeting keeps your brand top of mind. Consumerism is shifting away from the masses and becoming more individualized. So, we always like the personal touch of including a new mover’s name and identifying the nearest location and map or a link to directions. This gives you extra brownie points for convenience so they don’t have to “Google” directions themselves. With those who respond to the initial marketing efforts, we recommend obtaining their contact and content preferences. This will help with future communications and make the relationship even more personal. At LionShare, we live and breathe data, so it should be no surprise that we love to test, test, test! With our New Mover Programs, we test offers and analyze performance. We can do the same with creative, images, copy, subject lines, data segments and targeting options. Ongoing analysis of response rates and ROI of those test segments will uncover opportunities for revising tactics. The mail piece is a great knock on the door, but with the strategies we use at LionShare, we aim for the door to open and for you to be invited in to stay awhile. Just as New Mover Programs are more than a piece of mail, at LionShare we are much more than New Mover Programs. From our business intelligence tool, DIATA, to CRM/Marketing Automation, PRM, and everything marketing related in between, we continually keep up to date with the latest healthcare marketing trends and changes. Need help keeping up? Call LionShare at 1-800-928-0712 and we can discuss your needs. Aimee Chamberlin currently serves as the Director of New Movers & New Parent Programs and has been an indispensable member of the LionShare team for 12 years. 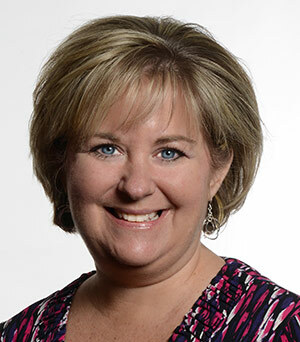 Throughout her career, Aimee has honed her management and organizational expertise through her leadership experiences, development of quality control systems and standard operating procedures, and refinement of turnkey marketing program processes. A graduate of Southwest Missouri State University in Springfield, MO, Aimee received her Bachelor of Science in Business with a Marketing & Advertising emphasis.